The Microsoft Dynamics 365 SDK offers a variety of methods and technologies to use when you write code to access the Microsoft Dynamics 365 (online & on-premises) web services or to extend the application. This topic provides guidance on the development style to choose depending on your technology area.. The first thing to consider while writing code to extend Dynamics 365 is whether your code is written using .NET Framework. Dynamics 365 SDK assemblies provides you with classes that you can use to connect to Dynamics 365 web services to identify your organization and perform common business operations like create, retrieve. update and delete data in Dynamics 365. The SDK assemblies are available as NuGet packages, and also included in the Dynamics 365 SDK download package. More information: Subscribe to SDK assembly updates using NuGet and Assemblies included in the Microsoft Dynamics 365 SDK. 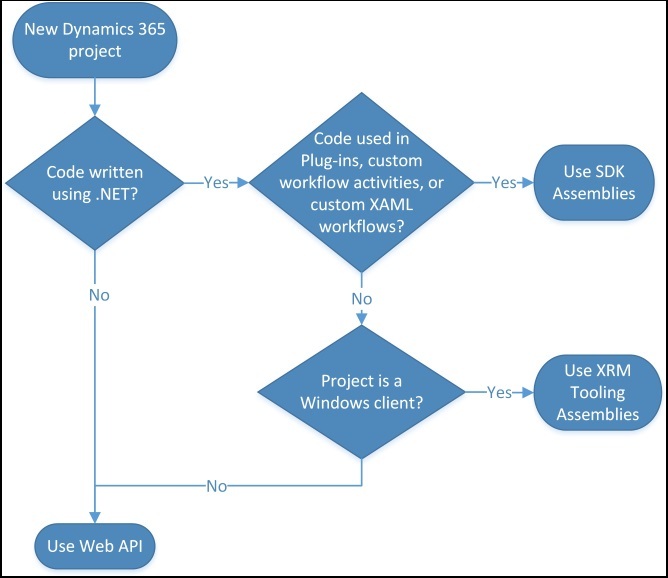 If you are using .NET Framework 4.5.2 or later to write your code, you should use the latest version of the Dynamics 365 SDK assemblies to create your plug-ins, custom workflow activities, or XAML workflows. Create and deploy plug-ins or custom workflow activities: The plug-in and custom workflow activity classes allow you to create event handlers to perform custom business logic that you can integrate with Microsoft Dynamics 365 to modify or augment the standard behavior of the platform. The XRM tooling assemblies are available as NuGet packages; the packages are found under the crmsdk profile. Select any package in the list with "Xrm Tooling" as the name to navigate to the package details page. The XRM tooling assemblies are also available in the Dynamics 365 SDK download package. Download the Microsoft Dynamics CRM SDK package. The Microsoft Dynamics 365 SDK assemblies use Windows Communication Foundation (WCF) technology to establish a communication channel with the Microsoft Dynamics 365 web services. Microsoft Dynamics 365 SDK simplifies use of the WCF technology by providing helper proxy classes that make it easy to write applications that connect to and authenticate with the Microsoft Dynamics 365 web services. Use the connection string, CrmServiceClient class, or XRM tooling PowerShell cmdlets to connect to Dynamics 365.